Everton manager David Moyes has rejected claims that uncertainty about his future is affecting the team after one win in five Premier League matches. "I think that's rubbish," he said. "We're still realistically playing for a place in the Champions League." Moyes, who joined in 2002, is out of contract at the end of the season and could wait until then before deciding whether to stay at Goodison Park. David Moyes became Everton manager in March 2002, with the club coming 15th that season. 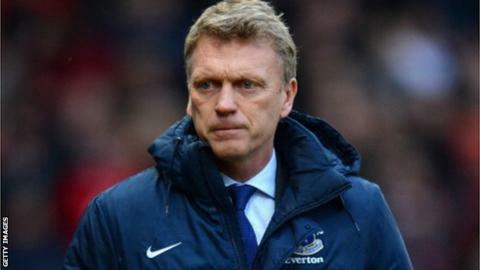 His lowest Premier League finish came in 2003-04 when Everton were 17th, although Moyes took them to fourth place the following year. Everton have finished in the top eight in each of the last six seasons. Everton are six points behind fourth-placed Spurs and still in the FA Cup. They drew 2-2 with League One Oldham last weekend and will play Wigan in the quarter-final if they win the replay. They visit Norwich City on Saturday and Moyes is hoping his side can push for a place in the top four between now and the end of the season. "Most seasons we've tended to finish sixth, seventh or eighth and if you ask the people who know football they would say that's about as good as Everton can do," said Moyes. "We've probably been playing at our maximum for a long time at Everton - foot hard to the pedal - and I'm hoping we can go a wee bit further this season and maybe do better in the FA Cup." For Everton to reach the targets laid down by Moyes, the former Preston North End boss says Belgian forward Kevin Mirallas needs to start producing more regularly. The 25-year-old, who was signed from Olympiakos in August 2012, has only scored once in the Premier League this season - his campaign disrupted by a hamstring injury which ruled him out between early November and late January. "I don't think he is firing on all cylinders," said Moyes. "He has not returned the way I would like him yet. "He is still getting used to the Premier League and I think he has to create me more goals and score me more goals. "That is what I am waiting for him to do, and he knows that - I have told him that. We are hoping for more. I think his form at the start of the season was excellent and we saw what he was capable of. "I don't think we have really had that from him since he came back from his injury."